ANCHORAGE, Alaska – Gov. Sarah Palin’s church is promoting a conference that promises to convert gays into heterosexuals through the power of prayer. “You’ll be encouraged by the power of God’s love and His desire to transform the lives of those impacted by homosexuality,” according to the insert in the bulletin of the Wasilla Bible Church, where Palin has prayed since she was a child. Focus on the Family, a national Christian fundamentalist organization, has scheduled the “Love Won Out” Conference for Sept. 13 in Anchorage, about 30 miles from Wasilla. 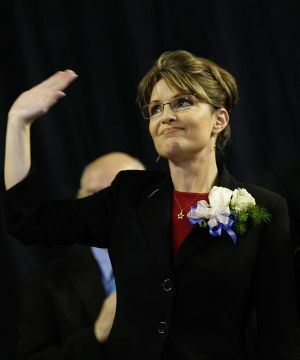 Gay activists in Alaska said Palin has not worked actively against their interests, but early in her administration she supported a bill to overrule a court decision to block state benefits for gay partners of public employees. At the time, less than one-half of 1 percent of state employees had applied for the benefits, which were ordered by a 2005 ruling by the Alaska Supreme Court. Palin reversed her position and vetoed the bill after the state attorney general said it was unconstitutional. But her reluctant support didn’t win fans among Alaska’s gay population, said Scott Turner, a gay activist in Anchorage. “I think gay Republicans are going to run away” if Palin supports efforts like the prayers to convert gays, said Wayne Besen, founder of the New York-based Truth Wins Out, a gay rights advocacy group. Besen called on Palin to publicly express her views now that she’s a vice presidential nominee.